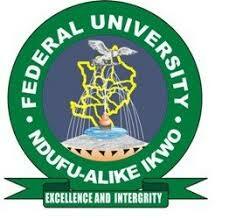 The authority of Alex Ekwueme Federal University, Ndufu-Alike, (AE-FUNAI) Ebonyi State has debunked a news publication that appeared recently in some sections of the media with the effect that the Federal government has approved Federal Teaching Hospital, Abakaliki (FETHA) as AE-FUNAI Teaching Hospital. A press release issued by the institution’s registrar, Mrs Odisa Okeke, stated that, “the attention of Management of Alex Ekwueme Federal University, Ndufu-Alike, (AE- FUNAI) Ebonyi State, has been drawn to a news item on page 39 of the Daily Sun newspaper of Friday, February 15, 2019, entitled “FG Approves Federal Teaching Hospital Abakaliki (FETHA) as AE-FUNAI’s Teaching Hospital,” which contained serious misrepresentations of facts. “The vice chancellor during the 53rd regular meeting of the University Senate held on Thursday, February 14, 2019, noted the approval of the Federal government, through the Federal Ministry of Health, for the use of Federal Teaching Hospital Abakaliki (FETHA)) for MBBS programme of Alex Ekwueme Federal University Ndufu-Alike, Ebonyi State. The vice-chancellor never mentioned that the provost of the institution’s medical college would take over the leadership of the teaching hospital. The university and FETHA are two different Federal government institutions; of this, we are fully conscious. “The vice-chancellor and the management of AE-FUNAl understand and are fully aware that the responsibility for the appointment of a CMD of a federal teaching hospital is not that of the vice-chancellor of an affiliated university, likewise the official public release of such information,” Mrs Okeke stated. She further stated that the views espoused in the said publication did not represent the correct account of events, and did not represent the view of the management of Alex Ekwueme Federal University Udufu-Alike, Ebonyi State. She, however, regretted any inconvenience the said publication would have caused the concerned stakeholders, especially the management of Federal Teaching Hospital Abakaliki (FETHA).